This grammar has been written to help the student to think in the Japanese way. Part One contains several introductory notes on Nomenclature, Syntax, Verbs, Aru, Iru, Oru, on Adjectives and on Foreign Words. Part Two concentrates on connectives – the particles and suffixes which modify the sense of other words or show the relationship of these words to each other. 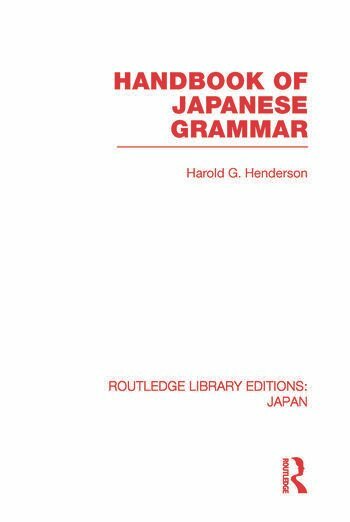 These connectives, the heart of Japanese grammar, present unusual difficulty to foreign students. Arranged alphabetically in dictionary form, each word is followed by a textual explanation of how it is used and of its various meanings, with cautions as to its translation. The forms covered include not only those of the "standard" colloquial literary or bungo styles, but also the more common colloquialisms and provincial forms, whether or not these are strictly grammatical. No other text available makes as through or as complete a classification. Introductory Notes. Note on Nomentclature. Literary And Colloquial Languages. Grammatical Terms. Note on Syntax. Note on Verbs. The Colloquial Conjugations. The Bungo or "Literary" Conjugations. Note on Aru, Iru and Oru. Note on Adjectives. Conjugation of Adjectives. Quasi-Adjectives. Note on Foreign Words. Dictionary of Particles, Suffixes and Other Connectives.